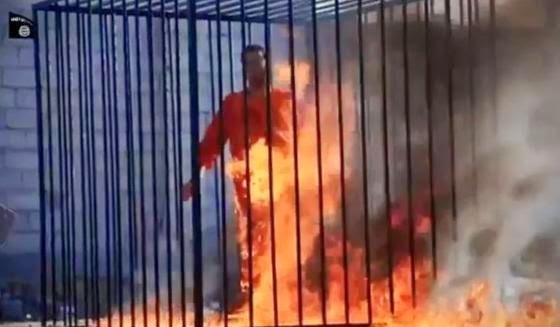 ISIS burned a man alive. He was a Jordanian pilot who fell into the hands of ISIS after his fighter jet crashed in ISIS territory. Everyone who pays attention to the news knew that this wouldn't turn out well for him. ISIS is made up of savages. Savages who want to kill you, me, your children, your parents, your aunts & uncles, your grandchildren, your grandma & grandpa, your cousins, and your dog. ISIS has labeled all who do not think as they do as "infidels". I'm fine being an infidel. Perfectly fine with it. Because it means that I don't live in the stone age and/or practice a disgusting, radical form of a barbaric "religion" that only appears to be fit for the wretchedly insane. ISIS has killed many. Brutally. They usually make a big show about it when they do. Does that mean we're not supposed to know about it? Because they made a video, which some people call "propaganda", we're not supposed to watch it and inform ourselves? They produce high-quality videos about their sad little story - actually, I envy them for their video-editing software - that always results in the barbaric death of some poor guy that they've been holding hostage. Some people think that it's a bad idea to share the videos that ISIS produces because they think it helps to spread their ideology. That's a load of crap! It's an excuse used by those (like our president) who don't want to call someone a bad name...a bad name like "terrorist". I think that the ISIS videos should be easily accessible for everyone to see (and, they are available online if you spend some time looking for them). Actually, I think the ISIS videos should be required viewing for all Americans. I don't like the idea of having an even more ignorant population that we already do. INFORMATION is essential to safety. Willful ignorance doesn't help anyone, nor will it help keep you or your family alive. I've always sought out the videos because I NEED to see them. Not because I WANT to see them. (And every time I have to go LOOKING for one of the videos it pisses me off. I shouldn't have to seek them out. They should be easily accessible!) I really can't stand watching them. They always make me feel sick to my stomach and disgusted with humanity. Yet, while I force myself to stay educated about man's inhumanity to man, others can't even stand to listen to a description of the videos? Yesterday on FOX News Shepard Smith described the latest ISIS video - a 24-minute video that results in the Jordanian pilot being burned alive in a cage - which is shown in the video. He burned alive for 55-seconds. Shep warned viewers that he was going to be describing the video for the "next 5 or 6 minutes" and that if they didn't want to hear it to mute the TV or "walk away" from the TV. Are you kidding me? There are Americans that can't handle a description of a brutal video? These are the people that need to see what the brutal savages on the other side of the planet want to do to them...because these savages know how to board planes and travel. ISIS crucifies, beheads, rapes, amputates, burns people alive, throws people off the roofs of buildings, stones people to death, and does God knows what else to them. All because they don't live their lives like the barbarians that comprise ISIS. You don't live like the savages in ISIS. Therefore, ISIS will kill you too, as soon as they get the opportunity. I don't know why someone would willfully choose to remain ignorant about this.